As I walked into Room 42 on the second floor of the British Museum in London recently, two massive stone engravings greeted me – a work with the word Bismillah (“In the name of God”) and the other featuring Ayatul Kursi (verse 255 of Surah Al Baqarah, Quran 2:255). Similar engravings in wood and paintings can be found in any typical living room in Muslim households, mine included. It is an impactful touch in placing these engravings at the entrance of the newly-opened The Albukhary Foundation Gallery of the Islamic world at the heart of the British Museum. Not only are these verses familiar to Muslims, they give precedence to the narrative that accompanies the exhibition. This permanent exhibition – spread across two refurbished galleries – is a new addition to the British Museum. Funded by Malaysian-based Albukhary Foundation, it brings to prominence the cultural significance, breadth and impact of the Islamic world. It also explores a certain spirituality – from the seventh century to the present day – that defines what it means to be Muslim. As a gallery tip, I do suggest visitors start from the left hand side of Room 42, go clockwise, then explore the middle part, before going through Room 43 in the same manner. This way, visitors can experience a chronological journey of the Islamic world through artefacts, tiles, sculptures, paintings, textile, engravings, art, music and literature. 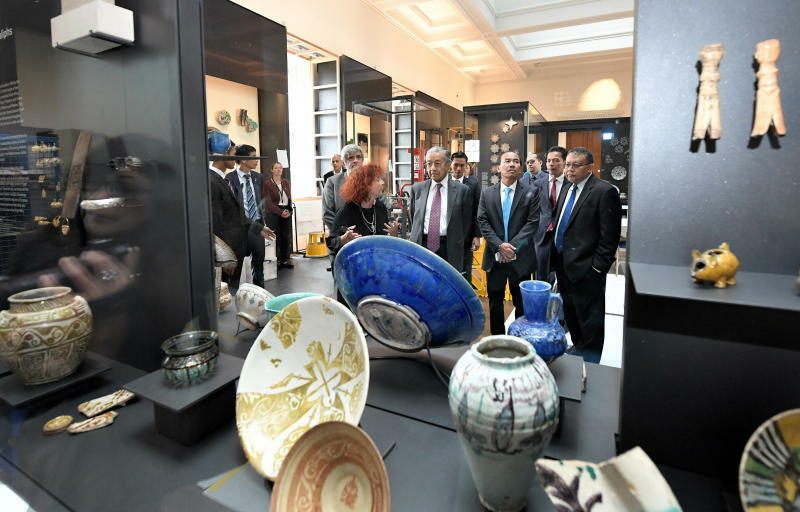 The exhibition attempts at being inclusive, where artefacts showcased are not only from the Arabic and Ottoman cultures – typically seen to represent Islam in many museums. Sufism, Sunni and Shiites sects are acknowledged as are the mix of influences that accompany the spread of Islam through both war and trade. However, minority Muslim groups such as the Ahmadiyyas are overlooked. Personally, I feel that Muslim women were not too visible throughout the exhibits. I was expecting to see more than just a diadem, a couple of bridal headgears worn by Kyrgyz and Kazakh brides, and a few pieces of traditional clothing worn by Muslim women across the world. This Alhambra tile was acquired from the Alhambra in 1791 by a traveller to the site. The Nasrid rulers were responsible from 1232 for the construction of the Alhambra in Granada, one of the best-known examples of Islamic architecture in the world. The Minang in me felt acknowledged by the piece of kain tangkuluak (ceremonial headdress) on display, but I was looking for the kebaya, instead I found a keris (Malay dagger) and pending (belt buckle worn by men) in the South-East Asian section of the exhibition. Further along, achievements by Muslims in astrology, architecture, science, technology and literature are given prominence. Visitors can watch short videos (on the spread of Islam), or scan QR codes on phones to listen to qawwali music by the late Pakistani legend Nusrat Fateh Ali Khan, songs by Yusuf Islam (Cat Stevens) and poems by Kahlil Gibran, Hafiz and Rumi. I find there should be more acknowledgement of female scholars. After all, it was an Arab Muslim woman by the name of Fatima Al-Fihri who started the world’s first university. She was one of the many who pioneered education for Muslim women. For me, the highlights of the exhibition are the contemporary pieces. Two artworks deserve mention – firstly, a “destroyed” copy of Farid ud-Din Attar’s A Conference Of Birds by Iraqi artist Hanaa Malallah to represent the destruction of libraries in Iraq following the US-led invasion in 2003, and secondly, a linocut print by Iranian painter Charles Hossein Zenderoudi depicting the battle of Karbala where Hussain, the Prophet Muhammad’s (PBUH) grandson, was killed, foreshadowing the long divisiveness between Sunni and Shiite Muslims. If the aim of the exhibition is to celebrate the Islamic world by acknowledging that Muslims hail from many cultural backgrounds and can adapt our faith with our cultural heritage, then this exhibition has achieved its goal. Just from the snippets of multilingual conversations that I overheard while attending the launch on Oct 18, and walking through the exhibition, this new addition to the British Museum has allowed for Muslims and non-Muslims alike to gain insight into the beauty and diversity of Islam. For more info on The Albukhary Foundation Gallery of the Islamic world at the British Museum, visit: islamicworld.britishmuseum.org.